- Measured the width of the field of view (FOV) every ten Z Numbers. 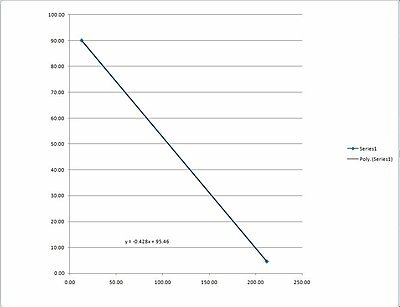 - Plotted the Z=0 and Z=99 FOV against the published focal lengths in an Excel chart, and let Excel calculate the linear regression for the expected FOV intermediate focal lengths. - Used the regression to convert intermediate FOV numbers to focal lengths. - Also converted actual camera focal lengths to 35mm equivalents (7.22 conversion factor). 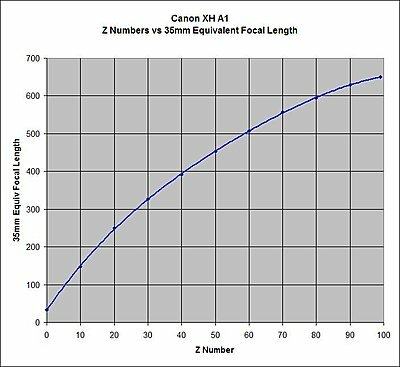 - Replotted focal lengths against Z Number. Here is the XH A1 chart. I didn't test the Wide Angle, but you should be able to multiply by 0.8 and get the 35mm equivalent focal length. That will come in handy. Thank you for that. With my primary work being 35mm/digital photography, I have been trying to figure out a way to visualize this for a while. Thank you very much for your work on this. Is the FOV intentionally in inches or really in supposed to be in degrees? True confessions: It is inches. I pointed the camera at the 24" point of a 48" carpenter's ruler. The inch numbers are the actual raw distance data from the left to right edges of the screen as observed on the Record Window of Canon Console software (so no issue with over/underscan). wow, this is amazingly useful! 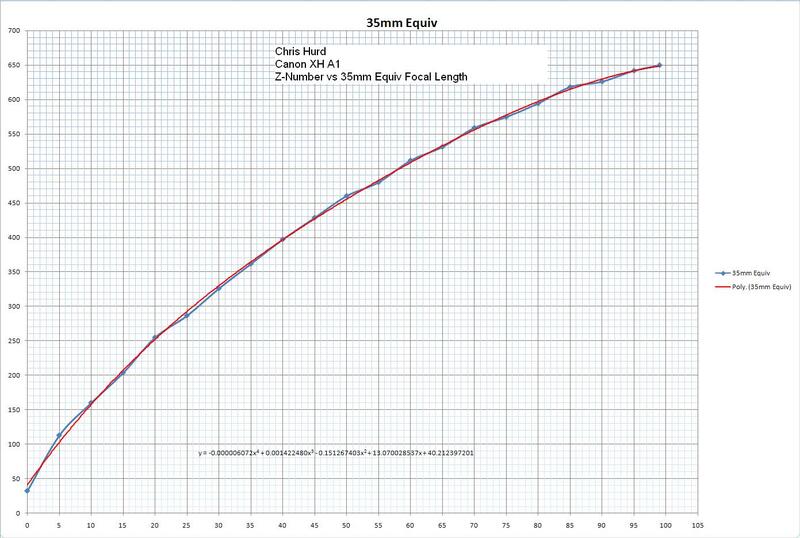 If I wanted to find out the 35mm equivalencies for the zoom numbers 1-10 would I have to rerun the experiment with single zoom number increments to get accurate estimates, or could I just plug the values listed here for Z1 and Z10 into excel and run an identical analysis and get accurate answers? If so how would I do this? I am pretty much excel illiterate. Pete, if your still around - how did you do this? Thanks Pete! Very, very useful! Totally missed it the first time around. 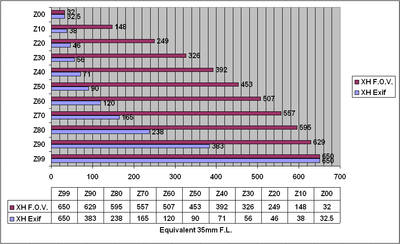 Based on your numbers, here's a rough, dirty, linear estimate of the 35mm equivalents between Z01-Z10. Great Michael! Can I ask how you extrapolated these? I guesstimated using Pete's calculations: 32mm at Z0 & 148mm at Z10. Turns out 11.6mm neatly adds up to 148mm. Not super accurate, but probably "good enough". 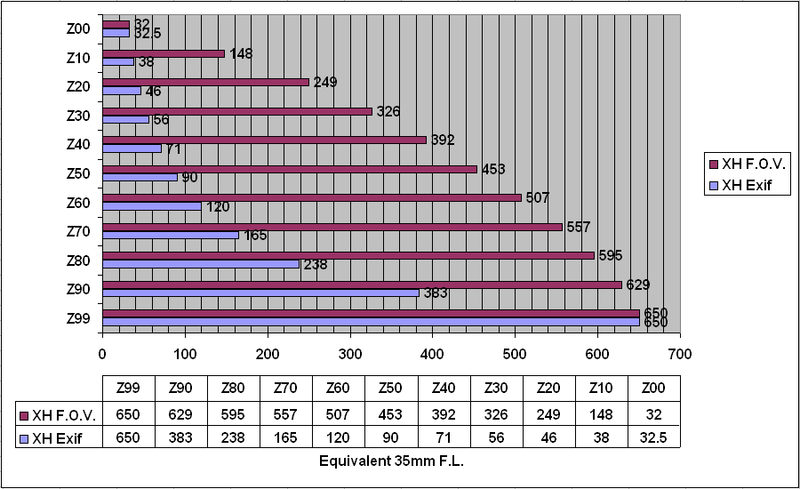 Z02/55mm + 11.6mm = ~67mm etc. ok so I've run my own tests on the Z#s 1-15 to get as accurate results as possible. The only problem is I based my test on the FOV of the lens being 58 degrees at full wide and now I think this was a false assumption. I should have no problem converting all my data if I can find out the true FOV at full wide. Does anyone know this? Also, the native resolution of the A1 being 1440x1080 vs 1900x1080 would result in the 1/3" sensor not having a practical sampling area of 3.6mmx4.8mm as traditional 1/3" chips do right? So would this need to be taken into account for determining FOV or does the automatic uprezing to full 1080 negate this? 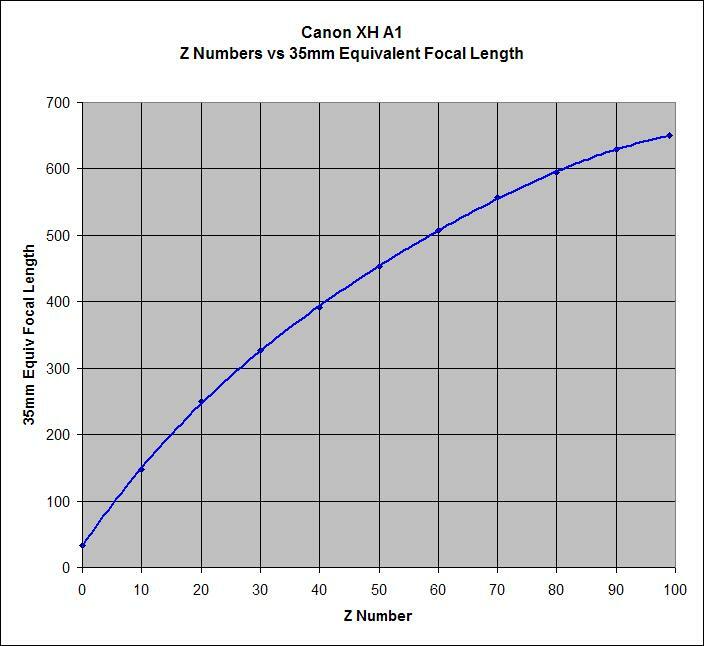 The first number after the Z# in the chart above is the actual focal length in millimeters and the second number is the focal length in 35mm terms of that field of view. As you can see it's substantially different from Pete's field-of-view test. How did I get these numbers? I enabled Still Image Recording and shot a .jpeg to the SD card at each Z number, and then noted the focal length as reported in the EXIF data which accompanies each image. My target was a brick wall about fifteen feet away. 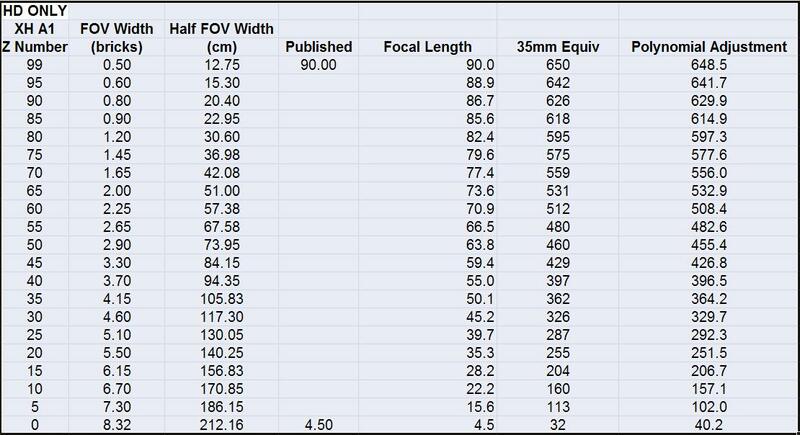 Anybody want to take a stab as to why the EXIF data is so very different from the F.O.V. test? Could the reason be related to the distance of the target? chris, your findings seem much more in-line with mine. Though I started with an incorrect FOV for full wide, the ratio of FOV values from one to the next as well as across the overall range seem very similar to your values. 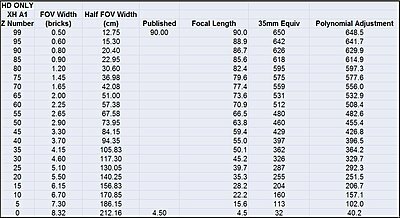 I basically started with the [false] assumption that at 32.5mm (4.5mm non-adjusted) the field of view would be 58 degrees and placed a ruler at a distance from the lens such that exactly 29cm were visible thus calibrating every 1/2 cm to equal a full degree. Then I just noted how many "degrees" were visible a each z#. But you say that when you take a still it embeds the focal length info? I certainly can't think of any reason why this would not be the most accurate data to go off of since it's coming straight from the camera. Light Metering		Center Weighted Avg. Chris and I had actually been communicating via email about this discepancy. We were really scratching our heads but then I have to admit that when the thread went dead before we figured out the reason for the difference, I let it drop. Still don't understand it, but then I'm nobody's expert in optics. Figure it either has to be a flaw in my technique or something peculiar about these complex multi-element lenses. Having only the 90mm and 4.5mm focal lengths and nothing in between, I did have to assume standard "rectilinear lens" equations applied (See this wiki page: http://en.wikipedia.org/wiki/Angle_of_view). That may or may not be the case, perhaps having to do with the behavior of a big zoom lens like this. One mistake I did make was to do my set up fairly close so I could get pretty accurate measurements using a 48" carpenter's rule. 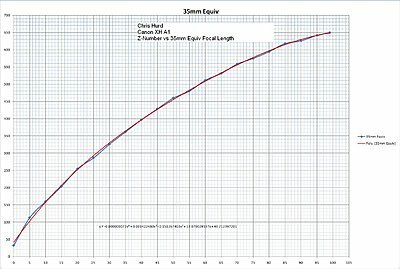 Chris had his brick wall closer to infinity but the measurement accuracy was a little more difficult..."was that image 6.25 or 6.33 bricks wide?" 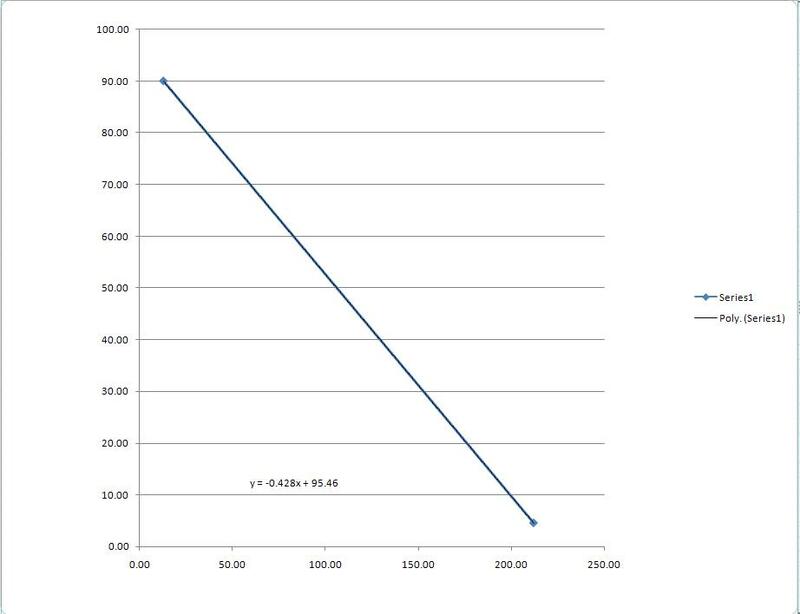 Surprisingly, though, when I gave it a go, his numbers came out similar to mine and letting Excel run a polynomial regression on the curve (that's the red line) makes the curve pretty darn clean (see attached screenshot of the graph). BUT, I used the same technique as described below, so any assumptions or errors would be duplicated. I guess what I can say is the proportions of the image width at each Z-number ARE pretty much correct (and I'd use the FOV numbers from the graph of Chris data since the distance he shot was closer to infinity). The question is whether there is some trick I'm missing in converting the image width into a lens focal length. I have to admit, seeing a minimal difference in the width of the frame going from Z99 to Z95 makes it hard for me to believe the EXIF data that drops the zoom by almost half. And conversely it makes more intuitive sense to me that the wide end, with a much greater relative change in image width from, say, Z0 to Z5, would have a larger focal length increase. Best I can understand, a doubling of focal length ought to halve the field of view for a rectilinear lens focused at/near infinity. But things ain't always what they SEEM, and I think it is a safe bet the the folks who design the lenses and the camera firmware that spits out the EXIF data know a bit more about optics than I do! Anyone a real-deal whiz at optics that can solve this puzzle?